There were twelve balloons, her favorite soup in bread bowls, along with the requested lady bug cake (what? it doesn't look like a ladybug to you?) filled with mint chocolate chip ice-cream. Zero to six...the speed of sound. Six to twelve... the speed of light. Happy Birthday, to my most favorite twelve year old in the whole wide world. Happy Birthday!!! Here's to more successes (fibery and otherwise) in your future, Libby! Happy Birthday Libby! Twelve is a big one! Leslie, I know how you feel. Was just looking at my oldest, who is 13 (soon to be 14) and I felt a little nauseous at how fast he was growing. Hope your daughter had the very best birthday a twelve year old could ask for! Cake sounds delicious, the photograph of her holding the balloons is the best, and soup in bread bowls sounds perfect. May your 12th year be one of your best! Always be yourself and celebrate your uniqueness! I saw the ladybug! and I love those colorful balloons! this is a birthday tradition I'd like to start. happy happy birthday to your special girl! Our daughter just turned 12 last month...it is a lovely age and yes, the time flies! Happy Birthday Libby! Happy Birthday. Love the photos. Don't they bring a tear to your eye to see them so young when it only seems like yesterday? Happy Birthday Libby! Looks like a ladybug to me! Happy Birthday!! If it was on the 3rd it was one day off of mine. November is a great month for birthdays. My little girl will be 8 on Sat. I can still close my eyes and be back in the hospital the night I had her just mesmerized by her!! Happy birthday, Libby. I love your boots. Sabrina will be 13 in January! I know...the time flies! Happy Birthday Libby! Have a lovely birthday Libby! Twelve is great! 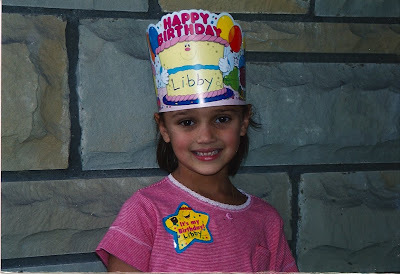 Have a wonderful birthday, Libby! Happy Birthday Libby! And the cake is adorable. Happy Birthday! And the ladybird is lovely. Twelve wishes to which we shall add, day after day, year after year, that she be all she dreams and lives all that she inspires! Precious! Brought tears to my eyes (especially because I have a six-year-old daughter like in your "before" photo!). Is there anything faster than the speed of light? Cuz that's what I'm actually hoping happens with mine, from 12-18. Just sayin'. Happy, happy, though, to yours! Happy Birthday to Libby! I LOVE the ladybug cake and it sounds tasty, too! That cake is adorable! Do you mean there was ice cream inside the cake? If so, how did you do that? Is it a Baked Alaska-style trick? Happy (belated) birthday to Libby! What a lovely young lady! Twelve is totally a big deal. Happy (belated) Birthday! Happy birthday Libby! Hope you had a great day! Yay! Happy day late birthday! Wow it seems like every time I see your kids have a birthday on your blog, I say wow, and feel like time flies as it does for my kids growing up almost the same ages!! Time does fly. Best wishes to Libby, you and your family. happy birthday dear libby! may it be a year filled with blessings and joy! Happy Birthday to your darling, Libby. happy birthday libby!! almost a teenager! my nephew has the exact same birthdate and no one can believe he is 12 already - so i can totally relate to how mom must be feeling. hope the day was wonderful in every way and that the ladybug cake was as good as it looks! Happy, happy birthday super girl! Happy Birthday Libby! that's my favorite soup too! I have been reading your blog for a few years now, and I just figured out that we both have 2 boys with a girl in the middle. Their birthdays are so close together, i can't believe it. Jack is going to be 3 on tuesday, and I think our oldest kids birthdays are less than a week apart too. many thanks for that recipe link, I tried it last night (lightened a little) and indeed, it tastes just like the Panera soup! loved it! Happy birthday!!!!!! What a delicious cake Libby has to eat!! WOW!!!! That is quite a beautiful little six year old you have there! Ah, sweet! What an adorable girl and perfect ladybug cake. Happy CAKE AND BALLOON day. happy birthday to libby! i hope you guys had a great celebration! Oh goodness, how did she get so old?! happy belated birthday Libby! ow, i forget that their birthdays are so close! happy birthday! Howdy, i learn bp claims process your weblog often and i personal an bp claims process identical one and i used to be just bp claims process wondering in case you get loads of bp claims process spam comments? If so bp claims process how do you forestall it, any plugin or anything you possibly can advise? bp claims process I get a lot lately it's driving me mad so any assistance is bp claims process very a lot appreciated. Anyway, in my language, there aren't much good supply like this.